If you don’t take care of your eyes they will quickly reveal your age and possibly your lifestyle! 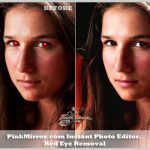 Luckily, you can clear up trouble spots such as crows feet with the help of the PinkMirror Crow’s Feet Removal feature. 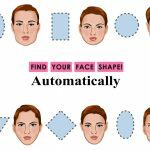 With just a few clicks of a button you can smoothen the skin around your eyes to shave years off your appearance and also hide the fact that you were out late the night before the photo was taken! They are small wrinkles which appear around the eye and usually begin at the outer corner. Crow’s Feet are typically associated with age and, unlike some other wrinkles which may show an element of ‘wisdom’, they are deemed to be rather undesirable. As you can probably ascertain from the name, Crow’s Feet tend to look like the foot of a multi-toed crow that is stamping on the corner of your eye. 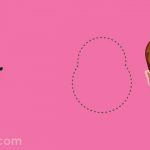 They generally start small and grow larger over the course of time and they may eventually end up on other areas of the face such as the cheeks and forehead. Exposure to sunlight is possibly the main culprit as the sun’s UV rays age the skin. However, smoking is another major factor; not just because of the reduced blood supply to the skin but also due to the fact that smokers often squint their eyes to protect themselves against the irritants in their cigarettes. If you’re a smoker, kicking the habit would be a very good start. You should also wear protection such as sunscreen and a hat when out in the sun and it is also important to embark on a skincare regimen as it can reduce the impact of wrinkles and Crow’s Feet. 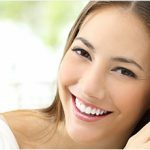 Unfortunately, Crow’s Feet are still pretty likely to appear regardless of what you do to prevent them. 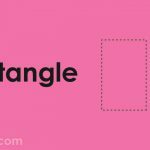 The above measures should significantly reduce their prominence which of course makes it easier for PinkMirror to perform its magic. Nonetheless, you can benefit from the Crow’s Feet Removal/Reduction feature regardless of how ingrained these wrinkles are. In the above photo we have a lady of advanced years in what is a lovely image. However, her Crow’s Feet are so large they almost dominate the picture which is not the look she was hoping for. Thankfully, she was able to call on PinkMirror to make her skin look naturally smooth. In this instance, some of the wrinkles and Crow’s Feet have been ‘softened’ while the less prominent marks have been completely removed. If you compare the pictures you will agree she looks 10-15 years younger in the ‘After’ image. 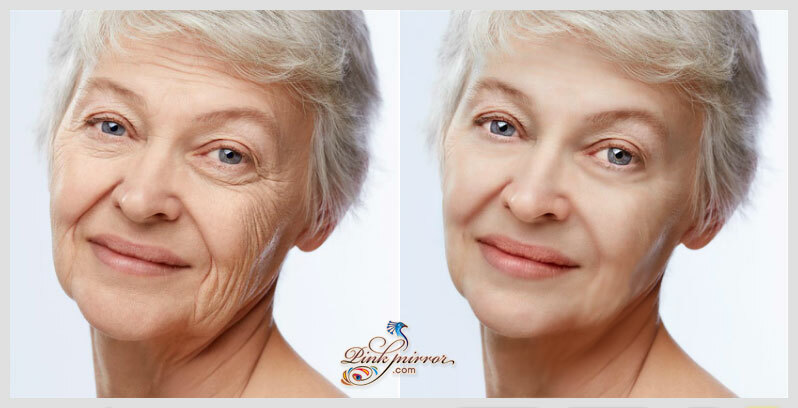 By removing and reducing the Crow’s Feet and other wrinkles, we also see that her eyes look more vibrant and her cheekbones appear to be more defined. 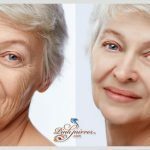 This is a typical occurrence because the eye is no longer drawn to the wrinkles and can see other areas of beauty on the face. 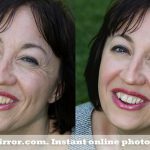 If you have Crow’s Feet that make you look old and haggard, we invite you to try removing or reducing them with PinkMirror and prepare to be stunned.